Although the tour had officially started with the stop at Plattsburgh, it wasn’t until we left Burlington and headed off to Grand Isle that it finally started to sink into my brain that the boat was embarking on a four month trip. On the way up to the dockage at Ladd’s Landing, we crossed the Grand Isle-Plattsburgh ferry route. The Lake Champlain Transportation Company continues the proud maritime tradition of Mr. Wilcox, Bell, Gordon and Corbin (early proprietors of ferry services on the lake). Starting in 1826 as the Champlain Transportation Company, LCTC has been in continuous operation since. Ladd’s Landing was the site of an early ferry, as many small points along the lake were, that connected Grand Isle and South Hero. Now, that point is connected via a lift bridge that opens for boats on the half hour. It always seems so narrow when we come through it, though there is plenty of space for us, even with the tug on the hip. 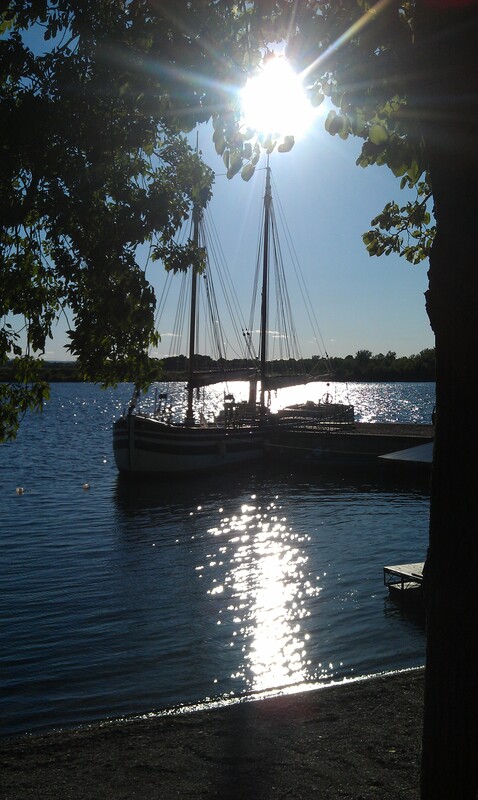 The Champlain Islands are full of history from the canal boat era. Full of raw materials, they quickly became significant in both the building of canal boats, as well as providing mariners to operate them. Almost all towns with any kind of waterfront had a place where you could commission a canal boat to be built, and many talented canal boat captains came from this area. After we pulled up to the wharf at Ladd’s Landing, the routine of being on tour began. The usual dance of getting the gangway out, power connected and our panels set up happened a little slower than I remembered, as everyone worked to remember the steps. The next morning, we began the ritual of getting the boat sparkling for the public boarding hours. 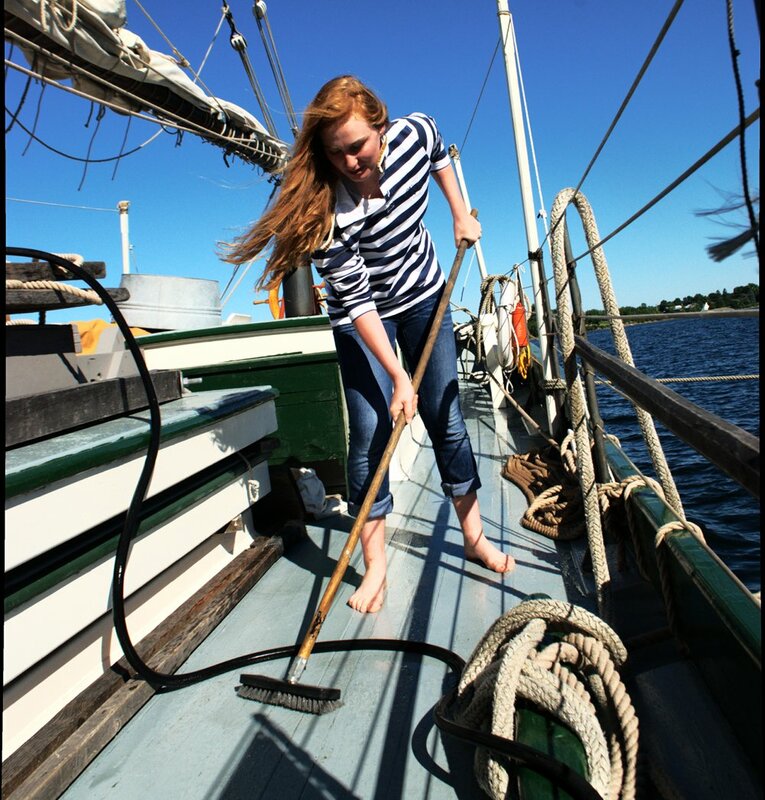 Molly Dunphy and Isaac Parker put in some serious effort with scrub brushes (we had let it slack a bit while we were in Burlington), and in no time, the boat was shining clean. Being able to connect with the public at such a great setting was a real treat. Having a canal boat docking in a place with such a rich connection lent the stories we shared an even deeper impact.